Notable for its quick-drying sling covering and simple, refreshing design, the Bazza Balcony Height Stacking Cafe Chair is ideal for elevated outdoor dining. 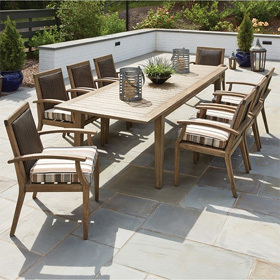 Low-maintenance yet sophisticated, it pairs perfectly with Telescope Casual's outdoor dining tables. Additionally, this outdoor cafe chair's aluminum frame and Marine Grade Polymer (MGP) accents will withstand the elements for years to come. MGP, a sturdy, nonporous material, was engineered specifically for outdoor use and salt water environments. Like all of Telescope Casual's outdoor furniture, this balcony height stacking chair was crafted in Upstate New York with care.